There are some very special wines among those reviewed here, and by the time they are featured in my end-of- the-year All-American list, they will undoubtedly be sold out. Nearly all the wines have already been released, and I believe most of the wines are still available from the wineries. If you are a reader of the PinotFile, you are familiar with the background information on the wineries, so I won’t go into extensive detail about them. There are a few Chardonnays reviewed as well. This majestic winery sits on top of a hill overlooking the vineyards of Napa Carneros. The winery dates to the 1980s when the Raventós family, heirs of the Spanish winemaking dynasty Codorniu, began acquiring land in Napa Valley. In 1997, it was named Artesa, from the Catalan word for handcrafted. 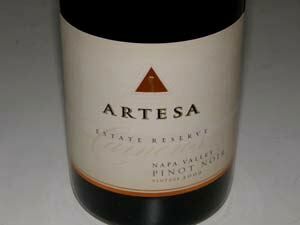 Today, Artesa focuses on Chardonnay, Pinot Noir and Cabernet Sauvignon crafted by winemaker Mark Beringer. The artfully designed visitor’s center is one of the most popular in the Napa Valley. Visit www.artesawinery.com. 13.8% alc., pH 3.55, TA 0.63, 2,500 cases, $20. Aged 50% in 30% new French oak and 50% in stainless steel. 20% estate fruit and 80% neighboring vineyards. 30% MLF. A portion of the wine was lees stirred for 5 months. Bottled after 6 months of aging. · Light yellow color and clear in the glass. Fresh aromas of apple, citrus and butter. Crisp and clean, refreshing and uplifting, with flavors of citrus, pear, roasted nuts, clove spice and a touch of tropical fruits. A pleasant, easy to like wine, offering excellent value. An Estate Reserve is also offered at $35. Good. 14.3% alc., pH 3.47, TA 0.57, 3,000 cases, $40. 100% destemmed. Aged 10 months in 40% new French oak barrels. · Moderately dark reddish-purple color in the glass. Bright aromas of fresh, very ripe plum and black cherry with hints of musk and grilled beef. Mid weight flavors of dark berries, black cherries and black plum with a hint of tar and earth. Very polished with good structural bones. A bit exotic, but very Carneros in character. Very good. Benovia Winery and the 41-acre estate Martaella Vineyard are located in the Laguna de Santa Rosa region of the Russian River Valley. 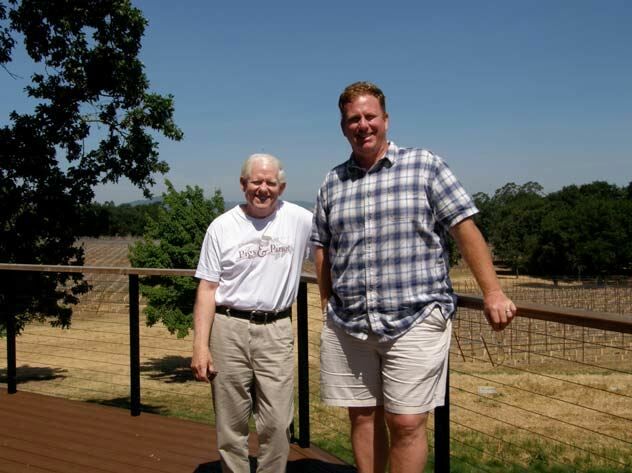 The winery produces Chardonnay, Pinot Noir and Zinfandel from both estate vineyards (Martaella, Cohn and Falstaff) and premium fruit sources under the direction of “Big Mike,” winemaker Mike Sullivan. The 2010 wines from Benovia are the finest to date and were released in the fall of 2012. Tasting by appointment. 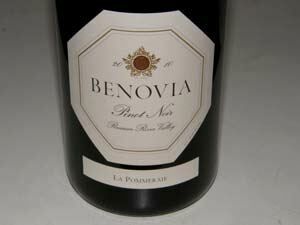 Visit www.benoviawinery.com. 14.2% alc., $56. · Medium reddish-purple hue in the glass. Deep red cherry perfume with notes of spice and cola. A flat out beautiful wine that is a killer on the palate with generous flavors of cherries and dark berries accompanied by a haunting bit of earthiness and sauvage in the background. Soft in the mouth, moderately rich in body, offering impeccable balance. The best Pinot Noir I have tasted from Savoy Vineyard in the challenging 2010 vintage. 14.2% alc., $56. · Medium reddish-purple color in the glass. Shy but pleasing aromas of blackberries, char and wet earth. Strikingly flavorful with oodles of dark berry and plum fruits dressed with exotic spices and smoky oak. The flavors hit the mid palate with a vengeance and march through to the finish with intensity and persistence. Soft tannins make for easy drinking now, but this wine is the most backward in the 2010 lineup and needs cellaring. At this stage, the flavors are ahead of the aromas. That said, it is a gorgeous mouthful of fruit now. Very good. 14.1% alc., $65. · Moderately dark reddish-purple color in the glass. The nose is more earthy than fruity with added scents of briar and forest floor. Redolent of lush, dark, earth-infused red and black fruits picking up intensity over time in the glass. Almost bruising in character. Very softly textured with balanced tannins and a very generous finish. Very good. 14.5% alc., $56. · Dark ruby color in the glass. Stunning aromatics featuring bright aromas of black raspberries accented with vanilla, oak and spice. The palate is soft, plush and long featuring delicious black cherry, black raspberry, black tea and cardamom spice flavors, finishing with an appealing crispness. This is a saucy, spicy number that grabs on and brings you to attention. Even better the following day from a previously opened and re-corked bottle. An 2013 All-American for sure. 14.5% alc., $48. · Pale golden straw color and clear in the glass. Aromas of ripe pineapple, crème brûlée, petrichor and banana. Stylish and smooth on the palate with a delicious array of complimentary flavors including apple, pear, lemon, buttered brioche, oak, caramel and spice. Beautifully balanced with a long finish. The apple flavor really stands out in this wine which tastes like the best apple pandowdy you ever had. A celebration. 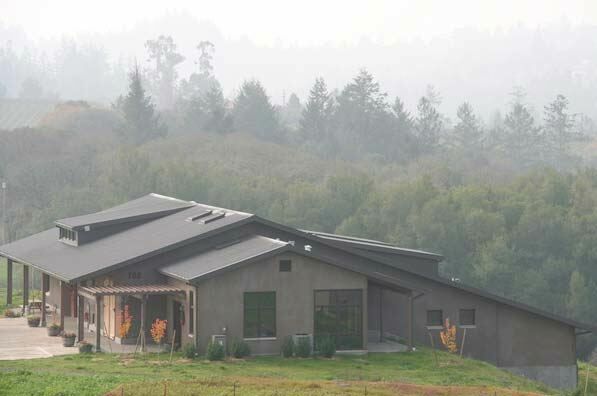 A family winery located in the northernmost reaches of Humboldt County, California. John and Kimberly Cabot had many years of experience in organically farming fruits and vegetables in Humboldt County when they began to plant wine grapes in 1998. Their first wine appeared from the 2001 vintage, vinified by John who is a self-taught winemaker. Larry Schaffer of Tercero Wines, a producer of Rhone varietals, plans to embark on a new joint venture with John Cabot. Pinot Noir is sourced from the Anderson Valley. 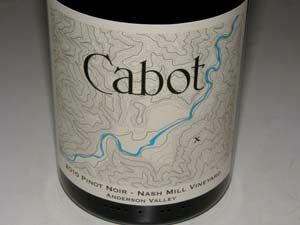 Visit www.cabotvineyards.com. 14.4% alc., 240 cases, $32. A blend of fruit from Nash Mill and Valley Foothills Day Ranch vineyards. A mix of Dijon 115 and 667. Aged 11 months in a combination of 75% once used and 25% new Hungarian oak barrels. · Moderately dark reddish-purple color in the glass. Aromas of cherries, cooked fruit and roasted nuts. Very ripe and sweet flavor profile featuring cherries, black currants, plums and raisins in a middleweight style supported by soft tannins and good acidity. Unchanged the following day from a previously opened and re-corked bottle. Decent. 14.4% alc., 45 cases, $42. A stellar 4-acre vineyard source located in the deep end of the Anderson Valley adjacent Burt Williams’ Morning Dew Ranch Vineyard. Pommard clone aged in once used French oak barrels. · Medium reddish-purple color in the glass. Shy aromas of dark red cherries and raspberries with oakdriven notes of toast and smoke in the background. Wood-infused core of cherries with some verve, augmented by balanced tannins and refreshing acidity. Finishes with much fanfare exhibiting a long cherry-driven flourish. 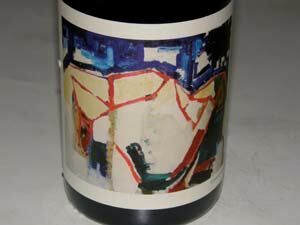 Tasted the next day from a previously opened and re-corked bottle, the wine had partially shed its oak topcoat, and the fruit was more expressive. I would give this wine a few years for the oak to integrate and by then it should be special. Good (+). Proprietor and winemaker Gavin Chanin studied under Jim Clendenen at Au Bon Climat and Bob Lindquist at Qupé and has crafted his wines in the same facility used by these two wineries. Bill Price, owner of Classic Wines, LLC (Three Sticks) formed a partnership with Gavin Chanin in 2012 to form Price Chanin Vineyards. The new wine brand will focus on small production, single-vineyard wines beginning with the 2011 vintage. Chanin will continue to produce wines under the Chanin Wine Company label as well as the new label at a newly established winery at Bien Nacido Vineyards. Visit www.chaninwine.com. 13.62% alc., $48. · Medium reddish-purple hue in the glass. Initially the showy nose offers aromas of black cherries, dark berry jam and a hint of oak spice. Over time bramble and floral notes emerge. A seamless wine of considerable appeal, featuring flavors of dark berries, spiced plums and savory herbs, supported by supple tannins and bright acidity. Velvety soft in the mouth with impressive length on the hi-tone finish. Plenty of vibrancy in this wine. Very good. Jim and Mary Dierberg farm three estate vineyards: (1) the 160-acre Dierberg Estate Vineyard just outside the town of Santa Maria with about two-thirds planted to Pinot Noir; (2) the 70-acre Drum Canyon Vineyard in the Sta. Rita Hills planted to Pinot Noir; (3) Star Lane Vineyard at the far eastern end of the Santa Ynez Valley planted to warm climate varieties. Wine production is at a winery on a ridge above Star Lane Vineyard. Nick de Luca was the longtime winemaker for both Star Lane Vineyard and Dierberg Vineyard wines, but was replaced in 2005 by Andy Alba, who had been part of the winemaking team at Dierberg Vineyard from the first vintage in 2001. 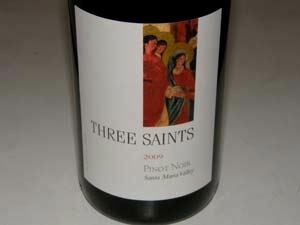 Pinot Noir is produced under the Dierberg and Three Saints labels. Visit www.dierbergvineyard.com. 14.1% alc., pH 3.51, $24. Sourced from estate vineyards in the Santa Maria Valley (Dierberg) and Sta. Rita Hills (Drum Canyon). 100% de-stemmed. Aged 6 months in 100% 1-year-old French oak barrels. Lightly fined, unfiltered. · Moderately light reddish-purple color in the glass. The nose offers an array of aromas including blackberry jam, black plum reduction sauce, soy, stem and herbs. Relatively light core of dark berry and Hoison sauce flavors with a hint of spice. The tannins are supple and well integrated and the acidity gives the wine some refreshing vigor. An easy drinker that is nicely balanced. Good. 14.5% alc., pH 3.65, $44. Sourced from Drum Canyon Vineyard planted in 2005. Low vigor rootstocks and a mix of heritage clones. Primarily native yeast fermentation. Aged 16 months in used French oak barrels. Lightly fining for clarity, unfiltered. · Moderately dark reddish-purple color in the glass. Aromas of black fruits, BBQ grill and toast. Vigorous with flavor and character offering a core of well-spiced and very ripe black plum and blackberry fruit wrapped in muscular tannins. Soft and plush on the mid palate and on the very dry finish. A full-bodied, fruit-driven wine that is a touch jammy in character. Good. 2013 marks the 20th anniversary of Littorai, the iconic producer of Pinot Noir and Chardonnay founded by Ted and Heidi Lemon in 1993. Ted’s wines, all from cool climate coastal vineyards that he either owns or directly supervises, are classic in style that age extremely well. The 30-acre farm in Sebastopol is as close to any other in the New World to the biodynamic ideal of self-sustainability with minimal input and output. A hay-bale-walled gravity-flow winery was opened in 2009 where tasting is conducted by appointment (see photo below). The wines are sold largely by mailing list with some fine restaurant distribution. Visit www.littorai.com. 12.5% alc., $26. · Pretty golden peach color with a pink highlight. The aromas really explode from the glass when the wine is first poured. Scents of peach, nectarine and nuts. Similar in flavor to a Pinot Noir Blanc with highlights of Rainier cherries and white peaches. Bright with good integrated acidity and no detectable tannins. Love to have a chilled glass of this wine with a fresh cut slice of peach in it on a sunny summer day. Good. 13.1% alc., $60. · Light reddish-purple color in the glass. Takes awhile to open in the glass, revealing aromas of black cherries, dried rose petals and sweet pipe smoke. Lightly endowed with cherry and raspberry flavor picking up some intensity over time in the glass. Very silky with supple tannins. A bit lean and under-ripe. Unchanged the following day from a previously opened and re-corked bottle. Good. 13.7% alc., $60. · Moderately light reddish-purple hue in the glass. Nicely scented with aromas of fresh black cherry pie glaze, boysenberries and dark chocolate. Discreetly concentrated flavors of ripe cherries and berries with a riff of sauvage, supported by firm but not astringent tannins, finishing with some generosity. Solid wine but doesn’t emote. About the same the next day from a previously opened and re-corked bottle. Good. 13.4% alc., $70. · Medium reddish-purple color in the glass. This wine has one of those noses that brings you to your knees. Profuse aromas of perfectly ripe cherries and berries with an exotic spice and floral accent. Delicious middleweight flavors of cherry pie glaze, dark red berry jam, cola, spice and complimentary oak, finishing with impressive power and persistence. A very polished wine with everything in balance. Even better the following day from a previously opened and re-corked bottle. Thieriot Vineyard Pinot Noir is what first hooked me on Littorai years ago, and I relish the addiction. It just doesn’t get any better than this (although The Haven Vineyard bottling is very close). 13.3% alc., $75. · Medium reddish-purple color in the glass. A WOW! nose with effusive aromas of plum coulis, black raspberry and spice. Mouth-filling and mouth-coating flavors of black cherries, plums black raspberries and spice. Can’t say enough good things about this wine: perfectly anointed tannic structure, very slinky texture, and a big, big finish. 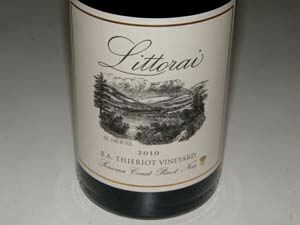 The sauciest of the 2010 Littorai wines tasted here with the most intense finish. Even better the following day from a previously opened and re-corked bottle. This wine will give the Thieriot a run for its money. The best Haven Vineyard Pinot Noir to date and the most approachable early on. 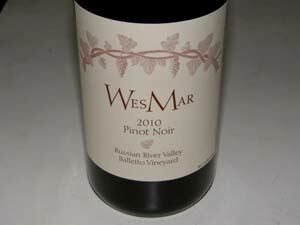 Tiny production, very little notoriety, great Pinot. 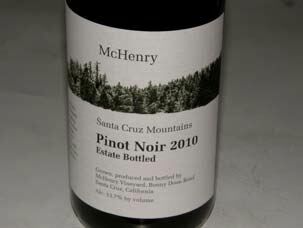 The McHenry family planted the vineyard in 1972 in the Bonny Doon area of the Santa Cruz Mountains at 1,800 feet elevation, five miles from the Pacific Ocean. The vineyard was devastated by Pierce’s Disease and ceased production in 1992. In 1997, the 2-acre vineyard was replanted. The wines are crafted in a delicate, elegant style. Aging is carried out in Francois Frères oak barrels for two years before release. Unbelievable value. 2009 Estate ($30) and 2010 Estate Swan Clone ($42) also available. Visit www.mchenryvineyard.com. 13.7% alc., 320 cases, $30. The McHenrys herald the 2010 vintage as “the best.” · Moderately light deep garnet color in the glass. Lovely aromas of cherries, strawberries, sawdust, cedary oak and a bit of Christmas cheer (spice). Delicious entry, mid palate and finish showing thick fruit flavors, yet delicate in structure and mouth feel. Dark red cherry, dark strawberry, and brown spice flavors are featured. Silky soft like the hair of an angel in the mouth with very impressive finishing presence. Highly unique and quite typical of this vineyard. A perfect marriage of power and finesse. Steve McIntyre has over three decades of experience in sustainable winegrowing in the Santa Lucia Highlands appellation. The McIntyre Estate Vineyard was originally planted by the McFarland family in 1973 and contains some of the oldest Pinot Noir and Chardonnay vines in the Santa Lucia Highlands. Steve McIntyre acquired the 80-acre property in 1987, which is now SIP certified. 37 acres of the Estate Vineyard are own-rooted Pinot Noir heritage clone, oldest in the Santa Lucia Highlands. There are 10 acres of Dijon clones 115 and 777 and 13 acres of Chardonnay Dijon clones 96 and 76. The winemaker is veteran Byron Kosuge. Visit the website at www.mcintyrevineyards.com to acquire the wines. A tasting studio is located at 1 Old Golf Course Road in Monterey. 14.79% alc., pH 3.51, 517 cases, $28. Dijon clone 76. Vinified at Copain Winery in Santa Rosa by Byron Kosuge. Whole cluster pressed. Fermented in new Siruge French oak barrels. Aged 8 months. 100% MLF. · Golden straw color and clear in the glass. Aromas of lemon curd, baked pear and banana pudding. Tasty core of pear, lemon-lime citrus, toffee and a hint of banana framed by bright acidity producing a juicy wine with a crisp finish. Good (+). 14.43% alc., pH 3.43, TA 0.69, 100 cases, $38. Whole cluster pressed, fermented in new Siruge French oak barrels and aged 8 months where it underwent full MLF. · Golden straw color and clear in the glass. Shy, but clean aromas of wet stones, peach, butter and acacia. A little more body and intensity than the regular Estate bottling with pleasing flavors of lemon, white peach, brioche, toffee and vanilla, offering a slightly creamy mouthfeel, and finishing dry and smooth. A Chardonnay that could benefit from a little more time in the bottle but hard to resist now. Very good. 14.7% alc., pH 3.63, TA 0.62, 241 cases, $36. From the SIP Certified McIntyre Vineyard. Dijon clone 777 and 115. Indigenous yeast fermentation and indigenous bacteria malolactic fermentation. · Deep, dark purple color in the glass. Very fragrant with intense aromas of blackberry jam, black plum sauce, black currants, spice and darkly colored rose petals. Just gorgeous. 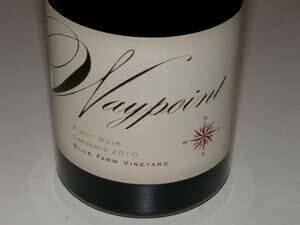 Delicious earth bound flavors of black plum, blackberry and black currant with a very subtle citrus note on the finish. Full-bodied, but not heavy or jammy. Very soft and ephemeral in the mouth with gossamer tannins and impeccable balance. This wine really speaks of the Santa Lucia Highlands. After Williams Selyem was sold in 1997, Burt Williams bought a 40-acre property in the deep end of the Anderson Valley located 4 miles west of Philo on a ridge at 750 to 800 feet above the valley. Under the guidance of vineyardist Steve Williams, the land was cleared and vines planted including cuttings from the Rochioli Vineyard, DRC suitcase selections from adjacent vineyards, and clones 23 (Mariafeld), 115, 777 and 828. Cool and windy with a southeastern exposure, the vineyard produces clean fruit with thick skins leading to concentrated wines of good color and rich tannin levels. Average yields are under 2 tons per acre. 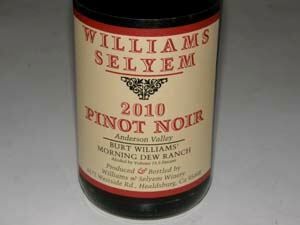 Williams crafted a small amount of Morning Dew Ranch Pinot Noir in 2008 and 2009. The 2009 wine was 100% destemmed and fermented for 15 days in open top, stainless steel tanks. It was then gravity racked to new French oak barrels. After 15 months, it was gravity bottled, never pumped, and bottled unfined and unfiltered. The 2009 wine is dedicated to the memory of Burt’s late wife, Jan. Williams has no plans to continue to produce wine after the 2009 vintage so this bottling is his swan song. The wine was released in the fall of 2012, but a small amount may still be available. Inquires should be directed to Burt Williams at Morning Dew Ranch, PO Box 487, Forestville, CA 95436. Owner and winemaker Kristie Tacey (see photo) specializes in Russian River Valley Pinot Noir. Armed with winemaking experience at Lost Canyon and JC Cellars and a Certificate in Winemaking from UC Davis, she launched her own label in 2009. The name, Tessier, is the original French version of Kristie’s last name, Tacey. 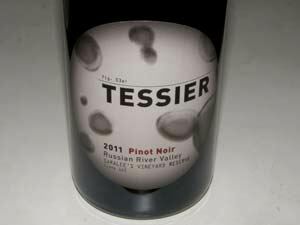 Visit www.tessierwinery.com. 14.8% alc., 96 cases, $35. Clones 115 and Pommard 4. Aged in 25% new French oak. · Light reddish-purple color in the glass. Quintessential Russian River Valley Pinot Noir offering aromas and flavors of fresh Bing cherries, baking spices, clove and a hint of cola and vanilla. Relatively light in weight, appealingly elegant with mild tannins, offering a silky mouth feel, and showing off some length on the finish. I really like this for its restraint and approachability. I would never guess this wine has moderately high alcohol. Very good (+). 14.8% alc., 45 cases, $42. Clone 115. Aged in 50% new oak. Decanted. · Light reddish-purple hue in the glass. Similar to the regular bottling but displaying more body and tannin and showing more potential for mid-term aging. Aromas and flavors of dark Bing cherries, baking spices and dark red rose petals with a hint of oak. Very polished and seamless, taking on more character and interest over time in the glass, but still holding back enough to suggest that the wine has a ways to go before it fully reveals itself. My only nit would be a subtle sense of heat on the finish, but I like this wine a lot. The wine reviewed here is from the Dos Rubios Vineyard (Dos Rubios means “two fair heads” in Spanish), a partnership between Rob Jensen, founder of Testarossa, and Kirk Williams. The vineyard was designed and planted specifically to Testarossa’s wishes, and winemaker Bill Brousseau oversees all farming decisions. 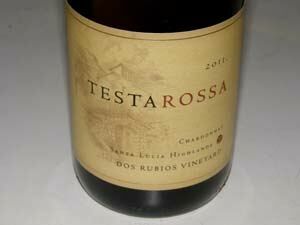 Testarossa was founded in 1993 by Rob and Diana Jensen and is one of the largest wineries in the Santa Cruz Mountains. The winery’s tasting room just outside the winery in Los Gatos is open daily. Visit www.testarossa.com. 14.1% alc., 282 cases, $39. Clones 76 and 17. · Moderately deep gold color with a tinge of orange and clear in the glass. Very shy initially, but opens gradually and becomes quite enticing later in the day from an opened bottle. Aromas of apple, citrus, grilled peach and vanilla. Soft and smooth, with flavors of white peaches, citrus, spice and a hint of nutty, toasty oak. Perfectly fine on its own, but has the balance, acidity and restrained oak to compliment many foods. Better later in the day from an opened bottle. Very good. A negociant wine program by Mark Steven Pope, owner of Bounty Hunter Wine in Napa, California. Waypoint is the cross section of two coordinates on a GPS, a precise and unambiguous place. In winemaking, the waypoint or vineyard is everything. The winery’s single-vineyard program offers wines sourced from partners with sites and growers that are first rate and their names are on the bottle. Visit www.bounterhunterwine.com. 14.5% alc., $35.95. This 7-acre Pinot Noir vineyard is in Anne Moller-Racke’s backyard and contains a mixture of clones. She has been farming grapes in Carneros for over 30 years and currently is director of The Donum Estate. The name of the vineyard comes from the blue Victorian farmhouse on the property. · Moderately dark reddishpurple color in the glass. Aromas of dark berries, Hoison sauce, cigar box and a hint of smoky oak. Tasty core of dark cherries and dark red berries with touch of toasty oak in the background. The fruit veers to the ripe side, but is hard to resist. A worthy mid-weight wine with silky tannins, a soft mouth feel, and a thrust of black cherry on the finish. Good. A small garagiste winery in the Russian River Valley modeled after the original Williams Selyem winery. Coowner Denise Mary Selyem is the daughter of Ed Selyem and both she and her co-owner spouse, Kirk Wesley Hubbard, worked at Williams Selyem for several years before the winery was sold in 1997. The two-person operation works out of a small industrial space in the former apple processing plant on Gravenstein Highway in Sebastopol. 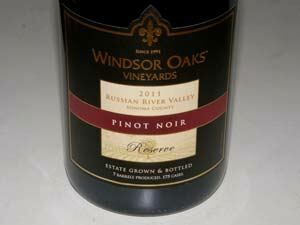 All grapes are sourced for a Russian River Valley appellation Pinot Noir and four vineyard-designated Pinot Noirs. The wines are all lovingly crafted by hand and consistently top shelf through every vintage. The 2010 vintage wines are classy, elegant and exhibit admirable balance. They are highly approachable now but will age. 2010 was a challenging vintage, and the wines reflect this. In 2012, the first two acres of an estate vineyard were planted in Sebastopol using Pommard and Martini clones. The wines are sold through a mailing list. Visit www.wesmarwinery.com. 14.5% alc., $37. A blend of fruit from the vineyard designates. Unfined and unfiltered. · Medium reddish-purple hue in the glass. Aromas of black cherry, cola, hay and floral notes. Modest richness, tasting of black cherries, plums, cola, and black tea. Nicely balanced with silky tannins and some finishing power. Good. 14.5% alc., $40. 12 acres of Martini clone planted in 1989 and farmed by Karl and Elaine Oehlman. Unfined and unfiltered. · Moderately light reddish-purple color in the glass. Relatively light in weight in this vintage with aromas of cherries, spice, bramble and tomato. Elegantly composed with flavors of cherries, strawberries, spice and red hard candy, framed by mild tannins and bright acidity, with some persistent cherry on the finish. Fine, but doesn’t emote. Good. 14.3% alc., $42. Unfined and unfiltered. · Medium reddish-purple color in the glass. Powerful aromatics offering scents of dark red berry preserves, sandalwood and tea leaf, picking up intensity over time in the glass. A very graceful wine with considerable charm, exhibiting intense flavors of black cherries, blueberries and plum which expand in the mouth and finish with remarkable persistence. Very flavorful, yet modest in weight, with good integration of acidity and tannins. A complete wine. Very good. 14.5% alc., $40. Pommard clone. Ninth vintage from this vineyard. Unfined and unfiltered. · Medium reddish-purple color in the glass. Lovely perfume of black cherry pie glaze, black raspberries, black currant jam, balsam and baking spices. Delicious core of black cherry and plum fruit flavors augmented by lavish, exotic spices that expands in the mouth to reach every nook and cranny. Very juicy and refreshing with a glorious citrus-cherry finish exhibiting considerable vigor. I seem to gravitate to this wine in every vintage (Pommard is my paramour). Simply sublime. 14.3% alc., $42. 8 clones. Unfined and unfiltered. Always the most backward wine in the WesMar lineup, needing a few years to blossom. · Very difficult to pull out much on the nose. Brooding darker berry jam aroma shows up after an hour in the glass. Full-bodied flavors of blackberries and black plum sauce with a note of loamy earth. Structurally sound with balanced firm tannins. Almost creamy on the palate with impressive length on the fruit-driven finish. This wine has a long way to go before it reveals itself. Decant if you must drink now. Tasted the following day from a previously opened and re-corked bottle, the wine was much more aromatic and appealing. Very good. A highly lauded and very successful winery producing about 16,000 cases of Pinot Noir, Chardonnay, Zinfandel and occasionally other wines from a winery at Allen Ranch (crushing and fermenting) and a new winery that opened in 2011 on Westside Road (aging, blending, storage and bottling). The new winery offers a striking contrast to its rural Westside Road location, with a two-story front constructed of steel, wood and glass, decorated with redwood salvaged from the old Almaden Winery. The wines are sold primarily through an allocated mailing list, whose members enjoy the benefits of tasting, tours and special events at the winery. The most desirable releases are snapped up after release, but don’t be afraid to inquire if there are wines of interest to you, as some may be available. The fall 2012 releases included 14 vineyard-designated Pinot Noirs ($52 to $100) including the newest vineyard sources of Olivet Lane and Morning Dew Ranch. The 2010 vintage wines are lighter and more elegant than usual with very appealing textures and excellent oak integration. Visit www.williamsselyem.com. 14.1% alc., $78. · Moderately dark reddish-purple color in the glass. Appealing aromas of brandied black cherry, dark berry, spice and faint oak, building in intensity over time in the glass. Soft in the mouth with flavors of black cherries, cola and carmelized oak with a hint of spice. A bit shallow on the mid palate and finish, but a satisfying wine overall. Good. 14.2% alc., $75. · Moderately dark reddish-purple color in the glass. Long and persistent scents of dark cherries and berries, bramble and exotic spices including clove. Moderately rich core of blackberry and black plum fruit with a floral and loamy earth undertone and reigned-in tannins. Good mid palate impression with an elegant citrus-fused finish that slips off the back of the palate like a silk sheet. Very good. 14.2% alc., $52. · Moderately dark reddish-purple color in the glass. Very shy nose initially, but opens nicely over time to reveal penetrating aromas of spiced plum, black cherry and white pepper. Tastes like the best plum sauce you ever had. Velvet-edged fruit with gentle tannins and a deep plum-infused finish that lasts more than 30 seconds. The whole package. 13.5% alc., $75. · Moderately light in color with a reddish tinge. Generous aromas of dark red fruits, bark and maple syrup. Light and elegant in style, but not wimpy in pleasure, infused with rocket-powered flavors of red cherries and berries, blueberries, and tantalizing baking spices. The fruit is invigorated by lively acidity, framed by fine-grain tannins and full of vibrancy on the refreshing finish. I can’t say enough good things about this gorgeous wine. This 710-acre estate has 250 acres under vine with 18 different varieties of wine grapes. The vineyards are located in three AVAs: Russian River Valley, Sonoma Coast and Chalk Hill. Grapes are supplied to 35 boutique wineries, with small amounts kept back to produce Pinot Noir and other varietals under the Windsor Oaks Vineyards label. The winemaker is Julie Lumgair and the consulting winemaker beginning in 2012 is Margaret Davenport. The estate is open to the public eighteen days each year as well as for VIP tours and tasting by appointment (707-433-3810). Visit www.windsoroaks.com. The Pinot Noir plantings are in the warmer reaches of the Russian River Valley so the wines from the 2011 vintage benefited from the growing season’s cool weather. 14.1% alc., 225 cases, $35. A blend of Dijon clones. · Moderately light reddish-purple color in the glass. The wine offers an array of pleasing aromas including cherries, red hard candies, herbs and dried rose petals. On the palate, it aims to please with deep red cherry flavor underlain with a hint of cranberry and baking spice. Quite juicy, with supple tannins and a saliva-inducing, mineral-laden acid spine. A fine reflection of the vintage. Good (+). 14.6% alc., 175 cases, $45. A blend of Dijon clones from the finest blocks. · Medium reddish-purple hue in the glass. Inviting aromas of black cherry pie glaze with an array of subtleties including vanilla, herbs and rose petals. Extremely tasty mid weight black cherry cola flavor with a slight savory oak note in the background. Well-honed, firm tannins, softly textured, finishing with a lush cherry salute. This wine displays the ripe, lush cherry flavor that has brought notoriety to the Russian River Valley. Very good. 14.5% alc., 145 cases, $35. Dijon clones 667, 115, 777 and 459. · Moderately light reddish-purple color in the glass. Well-perfumed with aromas of Bing cherries, smoky oak and cigar box. The middleweight core of black cherries with complimentary accents of vanilla, Coca-Cola and smoke is tasty. The wine is welcoming with modest tannins and a soft mouth feel. Good.